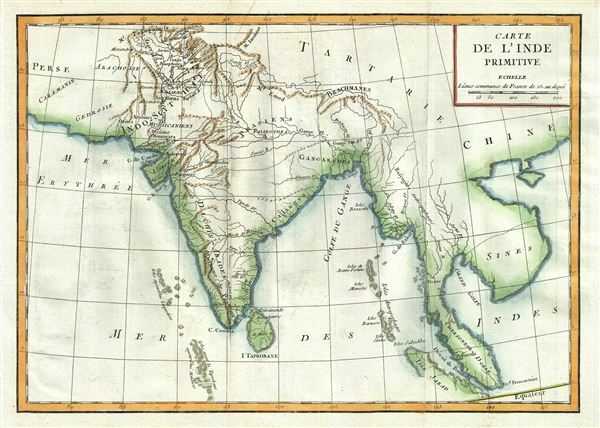 This is a fascinating example of the 1770 Jean-Baptiste-Claude Delisle de Sales' map of India. It depicts India during ancient times, as described by the Greek explorer and ethnographer Megasthenes in his work Indica. The map covers from modern day Pakistan as far east as Vietnam, inclusive of the Indian subcontinent, Ceylon (Taprobana), Southeast Asia, and Malay, and parts of Sumatra, Tartary, and China. Many ancient cities such as Minnagara (an ancient port), Taxila (now an important archeological site in Pakistan), and Barygaze (Bharuch, an important sea port and trading partner to the Greeks and the Romans) are identified. The ancient state of Gangarides (Nation of River Ganges), near modern day Bengal and Palibothra (Paliputram the capital of the Prasii or Magadha Kingdom) is also noted. Although part of this city has been excavated, a large portion still lies buried under modern day Patna. Several rivers, mountains and other topographical details are noted. This map was issued as part of Delisle de Sales' Histoire des hommes. Partie de l'Histoire Ancienne. Becasue most of Sales' work was burnt under the censorship of heresy, this volume is exceedingly rare.